How Do I Prevent My Dog From Slipping on Hardwood Floors? In case you are a pet owner in a house with hardwood or tile floors, you understand that this can at times be a poor combination. It could be difficult for your dog to walk on these slick floors. Some of these playful moments can flip into a canine edition of NASCAR. Lack of traction tends to make it challenging to corner or can cause a spin out plus a harrowing crash into the coffee table. The outcome could be an embarrassed puppy, damaged knick-knacks, and scratched wood floors. Your dog and hardwood floors may not go to well together for a variety of reasons. Hardwood floors are the trend right now in new homes and remodels, and despite how beautiful hardwood looks and how well upgraded your house now appears, compatibility with your pet is not always on par. Putting aside the fact that hardwood floors are slippery for even a young, healthy dog the honest truth about wood floors is all wood floors will scratch. Yes, that is correct. All wood floors will scratch. Many pet owners choose laminate over hardwood for this very reason, however it just may not have the same "look" you were hoping for. To prevent scratches on your hardwood flooring, make sure your dog's nails are routinely clipped and trimmed. In order to protect both your hardwood floors and those big (or little) puppy paws, consider dog boots as a solution. Hardwood floors and a variety of slippery surfaces may also allow it to be hard for dogs young and old alike to stand up from a reclining position. Some dogs even have difficulty sitting up in that perfect “good dog” placement without having their paws sliding out from beneath them. Traction may be a challenging problem particularly for older dogs that may possibly be getting a bit arthritic and also have trouble standing up on any surface area. Numerous canines as they age also have difficulties with their hips and lose management of their hind legs, making traction on any surface challenging. Going up and down non-carpeted stairs can be a real concern.There is a fun, modern, and practical answer to this dilemma and that is dog booties. When your dog’s paws are ensconced inside a comfy set of canine boots there is no more slipping and sliding and no more tell-tale scratches from his claws on these costly floors. You could generally think of dog boots for outside adventures like hiking, walking, and swimming and even just keeping mud and water from those paws. But they're also very functional if your dog has traction difficulty indoors. Most types of indoor dog booties are specifically made with treaded rubber or anti slip leather soles, which are commonly referred to as orthopedic boots - for your dog that might have trouble navigating your floors. A set of non slip dog booties can do the task. All that is required is actually a non-slip bottom. In the situation of older dogs that are losing the mobility in their hind legs, putting boots only on these back paws can do the trick. When traction is restored, so is their mobility. It isn't always necessary for a dog to wear the boots on the front paws as most dogs push off the floor mostly with their hind legs. Each dog is different and there may be a fair amount of practice and testing to determine the perfect solution to your slipping dog's needs. So no matter whether the problem is that your canine is scratching up your floors with his claws, slipping and sliding around the flooring or an aging dog that requires a lot more traction to maintain mobility, doggy boots might be the very best answer. 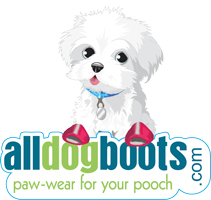 Take a look at our non-slip dog boots here. 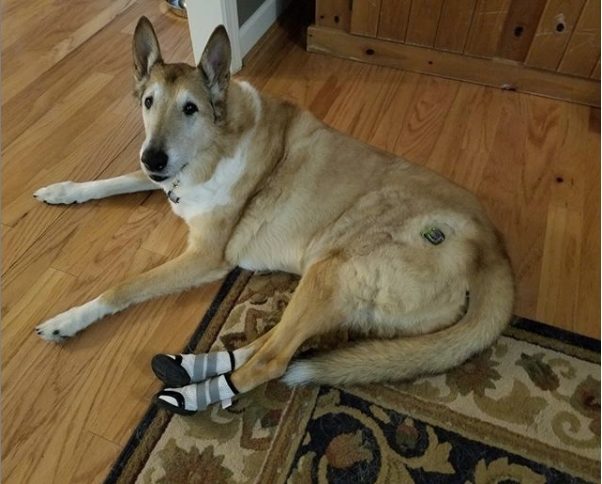 The video below a testimonial from one of our customers: “I never thought of using booties in the house, but the rubber bottoms really help 13-year-old Rusty get up on our slick wooden floors. The mesh tops allow them to breath, which is critical for long-term use, as dogs sweat through their paws.” If your dog is having similar issues to Rusty, be sure to check out our Meshies by Barko Booties.